Fixed a bug that occurs when merge some objects. Fixed the some issues with merging the animated objects. Fixed the issues with merging the CAT objects. Now the object hierarchy is not destroyed. Fixed the issues with Copy/Move the directories on the Favorites. Add the ability to Copy/Move the Catalogs to the Favorites. Fixed the bug with generation the bug-report. 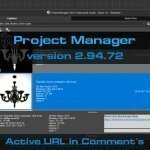 Related to "Project Manager v.2.12.00"